Over the past two years, the Johannesburg Housing Company, a non-profit social housing company in inner city Johannesburg, has been on a mission to deliver service that’s more customer-centric. One of the ways in which they are doing this is through the optimization of their rent payment facilities, which not only benefits the company itself, but also the tenants of their 4 300+ properties spread around inner city Johannesburg. And so, JHC embarked upon a project with Tactile Technologies that saw the deployment of self-service kiosks with generous 15-inch touch screens and custom-designed proprietary software that makes it quick, convenient and very easy for tenants to pay their rent. The challenge the Johannesburg Housing Company wants to address with the deployment of self-service touch screen kiosks as pay points in their residential buildings is the fact that the caretakers and housing supervisors who are responsible for collecting rent from tenants only work from 8am to 5pm every day. Most residents leave for work well before 8am and return well after 5pm, which makes paying rent a little tricky. 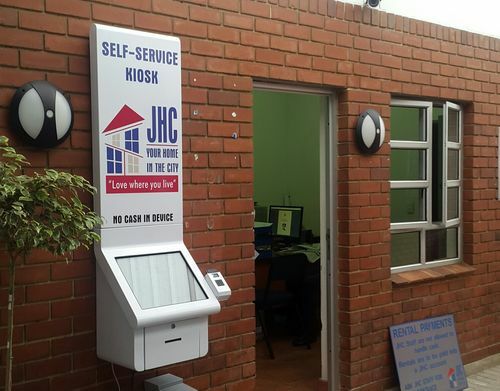 The self-service pay points the Johannesburg Housing Company have deployed make use of extremely simple software that tenants can use to insert their information and process rental payments without caretakers needing to be present. This offers tenants an on-site 24-hour payment method, which they can use at their own convenience. The touch screen kiosks that have been designed by Tactile Technologies come with several innovative features, such as a barcode scanner, printer and fingerprint reader. They have been loaded with an intuitive payment software that was specially custom-designed for the project. Manually, by typing in their unique resident’s code (of which every resident has one). Alternatively, if they’ve forgotten this code, they can type in their name, building, unit number, etc. By swiping their tenant cards, which will bring up all their details. They can then verify this information before moving on to the payment step. Through the use of fingerprint ID. Tenants can register for this sophisticated and safe feature by following the prompts provided by the touch screen kiosk. Once a tenant has accessed their profile, they can enter the amount they’d like to pay, which can be the full rental amount or just a portion. This is a particularly notable feature as it enables tenants to pay their rent in increments throughout the month as opposed to all at once at the end of the month. The entire payment process literally requires three button presses, all guided by easy-to-understand prompts. Once the transaction is successful, the user will be notified and a receipt printed. According to Karabelo, the average age of Johannesburg Housing Company tenants is 32, but today’s 32-year olds are a wholly different breed to the 32-year olds of 10 or even 5 years ago! Technology has become a mainstay of our societies, with even low income individuals owning a smart phone and being familiar with touch screen technology. The Johannesburg Housing Company wish to keep up with the changing times and in doing so, improve customer experience and service, making it quicker, easier, more efficient and convenient. Where’s the Project at Currently? The pay point kiosk project, which went live recently, is currently at its infancy. Wall mounted and freestanding formats have been deployed to strategically chosen locations. These particular buildings or “test sites” were selected for their size, number of tenants and the fact that these tenants were already familiar with paying their rent at a speed point. The goal of this initial rollout is to determine the response rate of the tenants to the new technology and whether there are any bugs or kinks that need to be worked out in the software. Once the data has been collected, the feedback assessed and any changes made, the Johannesburg Housing Company plans to slowly but steadily deploy more units to various residential buildings and to their head office. So far, the uptake of the pay point kiosks has been satisfactory. According to Revenue Manager Karabelo, they’ve seen rental payments made at all hours and several after midnight and very early in the morning, which just goes to show that the technology is performing its intended function and has provided a solution for a problem that used to exist. Who Is The Johannesburg Housing Company? The Johannesburg Housing Company is a non-profit social housing company that services people wishing to find accommodation within inner city Johannesburg. The primary business of this enterprise centres on the delivery of affordable accommodation to tenants that typically earn between R1 500 to R7 500 per month, although this isn’t a strict requirement. The Johannesburg Housing Company manages over 4,300 units located all over inner city Johannesburg and offers a wide spectrum of accommodation types at a starting price of R1 100 per month, from single rooms with communal facilities and bachelor apartments to self-contained single and double-bedroom townhouses. The Johannesburg Housing Company not only sources accommodation for low-income residents and families, they also purchase dilapidated buildings in run-down areas within the city and convert them into affordable, safe and liveable housing units. With an average of three people per dwelling, the JHC service about 12,000+ people.